Sesame oil black sesame is one of beneficial to our body. Sesame oil is one of the best detoksiciruuschee funds. The intake of sesame oil helps to increase the platelet count, improves the clotting blood. Sesame oil is used in diseases of the liver and heart. Sesame oil is used as Ayurvedic massage - Abhyanga. Oil the massage eliminates blockages in the body, thereby cleansing the body of toxins and improves the function of the gastrointestinal tract, activates the the cardiovascular system, gives the ligaments and muscles elasticity. 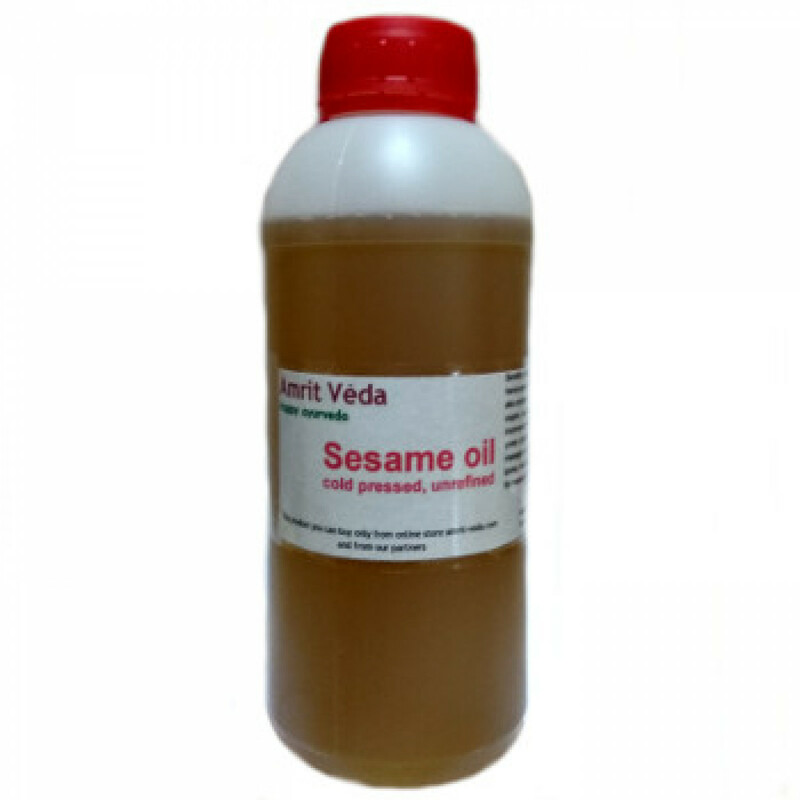 More Sesame oil from black sesame seeds is the basis for most Ayurvedic medicinal oils. As cosmetic sesame oil is used since ancient times. Due to its ability to penetrate deeply into skin cells, it softens and cleans. It is a natural antioxidant that prevents early aging of the skin. Sesame oil moisturizes the skin, relieves irritation, heals perfectly the cracks and sores. Due to the magnesium content, it has the relaxing effect on muscles and the nervous system. During its regular use normalizes the sebaceous glands, narrow pores, and she the skin begins to look younger and fresher. Release form: 0.5 l bottle from the medical! plastic. Attention! Sesame oil has a hot nature. If after using the oil in the summer you feel the heat on the skin, then you need to reduce the frequency of its use or to replace it until the autumn, for example, coconut. Original name: Black sesame oil, 500 ml Amrit Veda. In our store You can buy high quality Sesame oil from black sesame, 500 ml Amrit Veda at the best price!